The Atlantic hurricane season begins June 1 and the Eastern Pacific season began May 15. With factors like global warming1 and urban sprawl2 affecting storm intensity and impact, the need to be prepared ahead of time is more important than ever. During a storm, be prepared and listen for weather service announcements. Weather alert services come in two forms. The National Weather Service issues hurricane watches within 48 hours of the storm hitting. This allows for time to prepare your home and review your plans. Hurricane warnings come within 36 hours of the storm hitting, giving you time to finish preparing your home and evacuate, if necessary. Listen to the TV, radio, or other media tracking the storm’s progress for recommendations on what course to take. The National Weather Service alerts as to the path, speed, and wind force of the approach hurricane. From “Timely Tips When Disaster Strikes,” Judge Sherman G. Finesilver (1969). Click to enlarge. 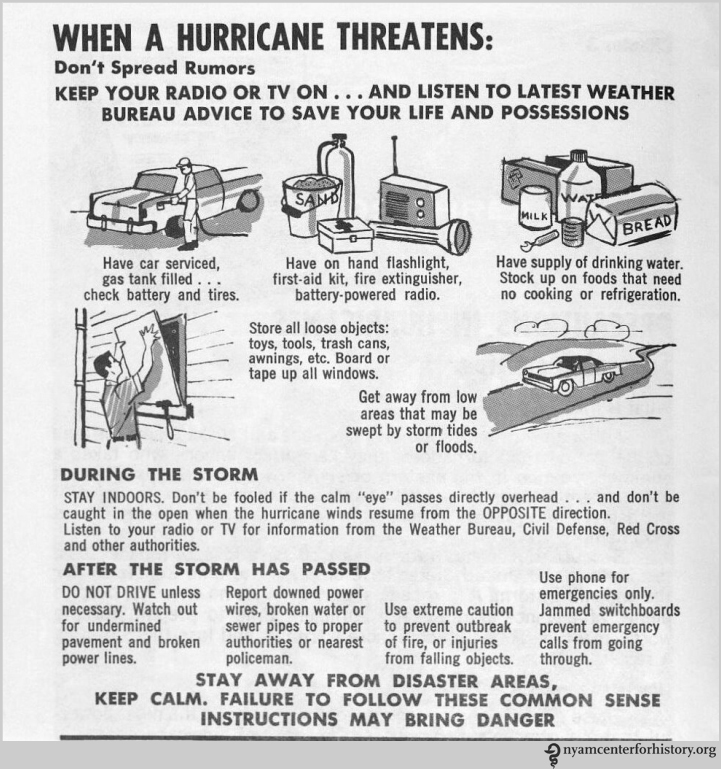 This entry was posted in Collections, History of medicine and tagged Atlantic hurricanes, disaster preparedness, hurricane preparedness, hurricanes, National Hurricane Preparedness Week by nyamhistorymed. Bookmark the permalink. Thanks, this is an interesting list and useful post. I live in Charleston, SC, a hurricane-prone area of the country. I wouldn’t have expected to find this on a Health and Books blog site! Glad that you found the post helpful. We highlight history and health issues from all across the spectrum.